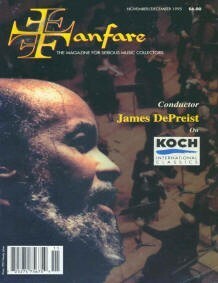 The African American conductor James DePreist, http://www.JamesDePreist.com, is the nephew of the famed contralto Marian Anderson. He was born in Philadelphia in 1936. While attending the Philadelphia Conservatory of Music, his website reports, Vincent Persichetti was his composition professor. DePreist contracted polio in 1962 during a State Department tour to Bangkok, but that misfortune did not prevent him from taking first prize in the Dmitri Mitropoulous International Conducting Competition a short time later. DePreist made his highly acclaimed European debut with the Rotterdam Philharmonic in 1969. That was also the year he won a Martha Baird Rockefeller Grant. 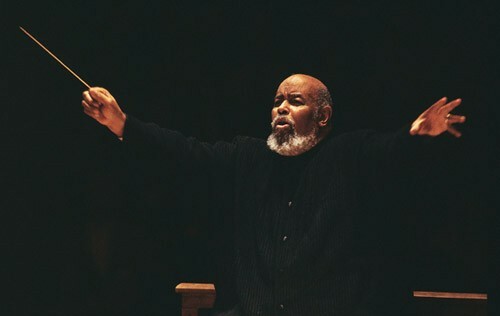 Antal Dorati chose him to become his Associate Conductor with the National Symphony in Washington, D.C.
Bruce Duffie interviewed Maestro DePreist in 1988. The transcript contains a number of interesting and candid remarks. It can be read at the website of Bruce Duffie. James DePreist has published two volumes of poetry, The Distant Siren (1989), with a foreword by Maya Angelou; and This Precipice Garden (1990). At PoetryFoundation.org, one can hear a 39-minute audio program in which comments on poetry are interspersed with several very attractive excerpts of music performed at New York's Lincoln Center by the Juilliard Orchestra under the direction of Maestro James DePreist. His varied recorded repertoire includes a celebrated Shostakovich series with the Helsinki Philharmonic and 15 recordings with the Oregon Symphony which have helped establish that orchestra as one of America's finest. 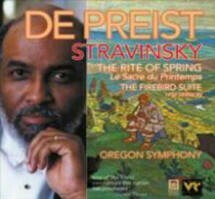 DePreist led the Oregon Symphony for 23 years, and remains its Laureate Conductor. Recording for me is absolutely essential. What we do as musicians normally evaporates as soon as it's created. That's the nature of concerts. In addition to inspired performances of standard works, you are especially admired for your consistent, effective, and passionate advocacy of music by American composers. In your tenure with the Oregon Symphony, you have conducted more than 80 different American works, by more than 50 different composers; many of these performances were premieres, and many have subsequently been recorded under your direction. Mr. DePreist began his association with The Juilliard School in 1987, according to a subsequent press release, when he conducted the Juilliard Orchestra with Gil Shaham as violin soloist in a performance of the Mendelssohn Concerto. A booster commemorated his 20-year anniversary with the Oregon Symphony by donating one million dollars for a 5-year recording project, from 2000 to 2005. Sidelined by a kidney transplant in December 2001, DePriest returned to the podium the following March, in a concert attended by his wife Ginette and his doctors, to whom he expressed his appreciation. Niel DePonte was one of 2003’s five Grammy Award nominees for Best Instrumental Soloist Performance with Orchestra for his recording of Oregon composer Tomas Svoboda’s Concerto for Marimba and Orchestra conducted by James DePreist and performed by the Oregon Symphony on Albany Records. Among his many other significant discs is Delos 3278, which features two important works by Igor Stravinsky, The Rite of Spring and The Firebird Suite. Conductor James DePreist has been named Director of Conducting and Orchestral Studies at The Juilliard School, beginning with the fall term in 2004. From 2005-2008, James DePreist was Principal Conductor of the Tokyo Metropolitan Symphony Orchestra as well. Maestro DePreist became Artistic Advisor to the Pasadena Symphony in June 2010. Early in 2011, DePreist relinquished the position of Director of Conducting and Orchestral Studies at Juilliard. He continued at the school as Principal Conductor and Director Emeritus of Conducting and Orchestral Studies. As a guest conductor he has appeared with every major North American orchestra, and internationally he has conducted in Amsterdam, Berlin, Budapest, Copenhagen, Helsinki, Manchester, Melbourne, Munich, Prague, Rome, Rotterdam, Seoul, Stockholm, Stuttgart, Sydney, Tel Aviv, Tokyo and Vienna. He made his London debut with the London Symphony at the Barbican in April 2005. 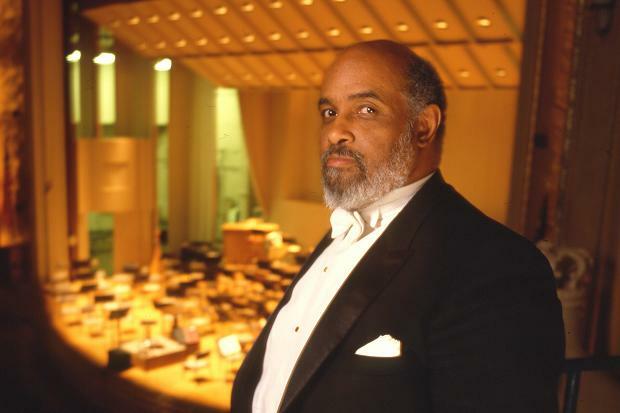 In 2005 James DePreist was notified by the National Endowment for the Arts that he was to be honored with the National Medal of Arts for his contribution to American musical life as a distinguished conductor. 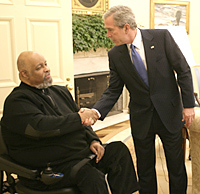 He received the medal in an Oval Office ceremony at the White House in November, 2005. 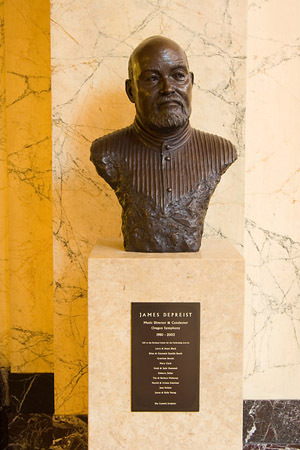 James DePreist's alma mater, the University of Pennsylvania, awarded its first “Creative Spirit Award” to him in November 2009 in recognition of his artistic leadership and life-long commitment to the arts. Size and Number: Mid-Size; One of a kind. Dimensions: 24x17x11 inches. Sponsored by friends and supporters of Maestro James DePreist. The surprise is the life he coaxes from this elemental metal. 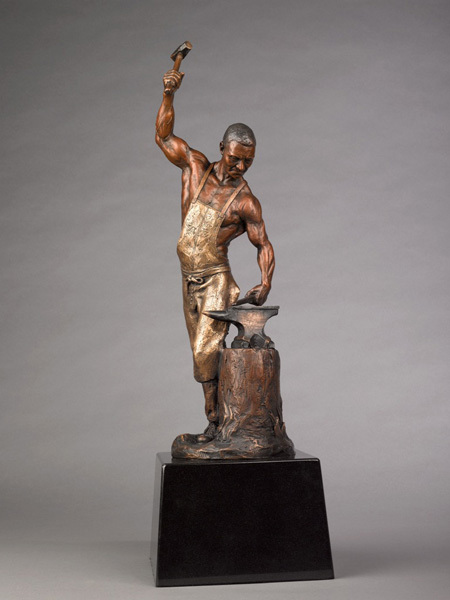 Commissioned by Oregon’s Volunteers of America, the exclusive bronze DePreist Award is given to those citizens who demonstrate the highest level of commitment to the community. In this one-hour documentary, symphony conductor James DePreist, who contracted polio as a young man, profiles three people with disabilities whose lives have been shaped by the struggle for equal rights. Mr. DePreist is the nephew of African American contralto Marian Anderson, who in 1939 was prevented from singing at Constitution Hall because of her race. He draws parallels between racial barriers and the barriers faced by people with disabilities. One of Maestro DePreist's most enduring contributions is his expansion of the repertoire of classical performances to include many more works of American composers than were previously heard by concert audiences. Another is his vast library of more than 50 recordings, which preserve many of the finest performances he has led. James DePreist has made his highly accomplished conducting accessible to countless classical music listeners of the present and future. Pioneering American conductor, National Medal of Arts winner and poet James DePreist died early this morning in Scottsdale, Ariz. He was 76 years old. His death, his manager told Deceptive Cadence, stemmed from complications following a heart attack he suffered nearly a year ago. DePreist was a survivor of polio, which he contracted on a 1962 State Department-sponsored tour to Thailand and which paralyzed both his legs permanently. Later, DePreist encountered another significant challenge when he developed kidney disease in the 1990s and had to go on dialysis — and remarkably, he received a new kidney from a devoted fan. It was on that 1962 Asia tour, however, that DePreist's professional life took an unexpected turn. He had been brought by the State Department to play with his jazz quintet; on something of a lark, he was invited to conduct a rehearsal with the Bangkok Symphony. That rehearsal led to an epiphany, as DePreist told Hurst: "You feel entirely differently than you felt before, ever, and you say, 'This is something that I could really commit my life to. And not only could I, I would be really bummed if I couldn't."